A majority of North America will experience a partial solar eclipse on Thursday, Oct 23, with the moon covering as much as seventy percent of the Sun near sunset. Most of the East Coast and Midwest will have the opportunity to capture some dramatic eclipse images. Viewers in the north will experience a deeper eclipse while those farther south and west will see the sun and moon higher in the sky. Experts believe that residents of the Midwest may experience the most spectacular views of the eclipse. A partial soclar eclipse happens when the new moon passes between the Earth and the sun, blocking part of the image of the sun. The very center of the moon’s shadow will not pass over the Earth. 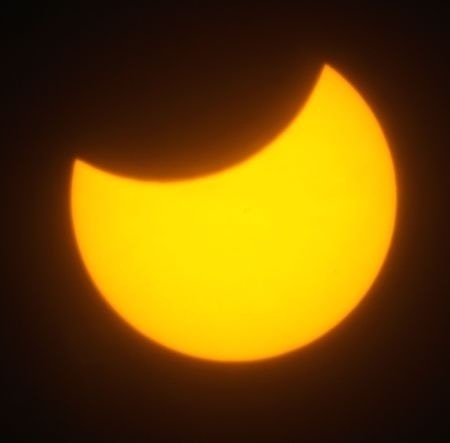 The eclipse will begin in eastern Siberia, where it will be Friday morning. It will then drift eastward and deepen as the moon orbits the Earth. It is never safe to look at the sun with the naked eye…even during a partial solar eclipse. Viewing the sun without protection can lead to eye damage or even blindness. Follow these tips from NASA to safely view Thursday’s partial solar eclipse. The safest and cheapest way to view a partial solar eclipse is by projection. Poke a pinhole or small opening in a card and hold it between the sun and something that acts as a screen…such as a giant sheet of white paper. An image of the sun will appear on the screen. Projected images of the crescent-shaped sun can even be seen on the ground when viewed beneath something like a leafy tree. You can also use binoculars to project an image of the sun onto a white piece of paper or card. However, NEVER look through binoculars at the sun. The partial solar eclipse can be viewed directly ONLY when using a filter specifically designed for this purpose. These filters typically have a layer of aluminum, chromium or silver on their surfaces. One of the most widely available filters is #14 or darker, welder’s glass. Aluminized mylar can also be used as a filter; however, only use filters that you know have been approved for solar eclipse viewing. There are telescopes for sale with sun specific lenses. Remember. NEVER use sunglasses to view a solar eclipse. Sunglasses let in harmful UV and infrared light and can cause permanent eye damage when used to view an eclipse. The sun will begin to be eclipsed at about 6 pm, and will reach the maximum crescent at about 6:30 pm. A total solar eclipse will occur in 2017 and should be visible across most of North America.